Peugeot is now offering right hand drive Partner vans in the same format as the Citroen Berlingo Multispace Forte. It's exactly the same vehicle with the same choice of 75bhp 1.4 litre petrol engine at £9,095 on the road, or 70bhp 1.9 litre XUD diesel at £9,360 on the road. C02 emissions are 168g/km (£140 VED) and 181g/km (£150 VED); combined fuel consumption 40mpg and 41mpg. 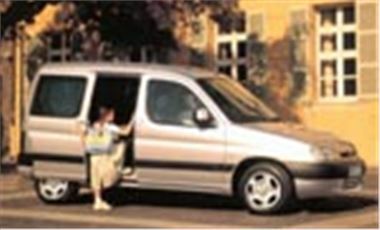 Standard features include two huge sliding rear side doors and a gigantic, washing machine swallowing hatchback; drivers airbag, side impact beams, seatbelt pre-tensioners, engine immobiliser, remote central door locking; three-point seatbelts for all three rear passengers; Isofix mountings for two child seats. It does nothing the Citroen Berlingo Multispace doesn't do, but if you live nearer to a Peugeot dealer than a Citroen dealer it's the obvious choice.